The Pro Pink Slim Pro Pouch has all the functionality of our regular pouch, with a smaller footprint, and the oversized pockets, allow you to hold more tools than the Ultra Slim Pro Pouch. This compact pouch is perfect for keeping your frequently used wrap hand tools nearby. 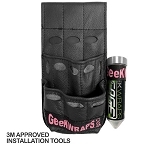 Included in this bundle is the powerful Mega Tether along with the Pro Pink Geek Wraps Utility Belt. This durable belt is non magnetic and it can be looped directly onto the pouch, or the Mega Tether for easy pouch release, it features two layers sewn and banded for strength and stiffness.